Kendra Barnes is on a mission to change the perception of what a Real Estate Investor is supposed to look like by encouraging and empowering millennials to invest in Real Estate. By the age of 30 she owned and managed 7 rental units. No, she did not hit the lottery nor was she left a hefty inheritance. She started out in Real Estate Investment with the goal of building wealth but had no idea what she was doing and jumped in anyways. These days, Kendra and her husband are owners of several investment properties in the Maryland and D.C. areas and educate others on all things real estate. 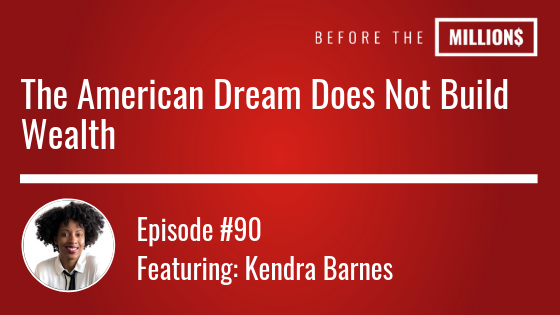 On today’s episode, Kendra and I discuss the challenges of living “The American Dream” and although she started her journey with a great life how she’s a big advocate for those who start with with nothing. Kendra is a big fan of Robert Kiyosaki but originally got started with no education in the space and just decided to take the leap of faith. Find out more on Kendra’s journey by listening to the interview. Listen to this books for free!